Jesse, my older brother, was the only baby of my mother’s who was not delivered with a midwife. My own mom had an experience similar to so many mothers engaged in the conventional medical model of birth. Her doctor was not there to assist in labor, only arrived shortly before his birth, and after having Jesse pulled from her with forceps, my mother sought other options with the rest of her children. I had been in Michigan for about five minutes before I became pregnant, so I had absolutely no idea where I was going to find a midwife who did home births. We found Kathi on the Internet, and I instantly knew after just fifteen minutes on her site, that she’d be the one delivering our baby. Her office was in her home, and after a short phone call to set an appointment, Dan and I found ourselves sitting in her living room flipping through books of all the births she had attended. Seventeen years of babies born at home. And even some that weren’t. Kathi was amazing. Every question, concern, anxiety she listened and provided me with information. Every appointment was not only the standard pre-natal visits of checking protein in the urine, weight gain, and listening to fetal heart tones, but it was a pregnancy counseling session. At my 24 week appointment, on all fours, she demonstrated how to rock my pelvis to begin coaxing the baby into an optimal position for birth. We drank tea, and laughed, Kathi and her assistants Katy and Allie, as I talked about my pregnancy, what I was feeling, and discussions about birth. I left every appointment feeling peace about my baby and my pregnancy, good energy, and books tucked into my purse. I certainly worried. I worried there was something wrong. I was sick to my stomach some days thinking there was going to be something we didn’t catch, some pathology. I worried about the unknowns. I told Dan the day of our ultrasound that we had to be prepared to say goodbye to this baby if we did indeed find problems which would only ultimately lead to his death. I ate an organic (mostly) diet, high in protein, calcium, omega-3?s and leafy greens. I swam at the beach, dove off the piers, surfed in the waves up until 16 weeks. I walked daily, sometimes several miles, and at nine months I was substitute teaching and climbing the sledding hills with the kids. I saw the chiropractor, a woman who had delivered all four of her whopper babies (the smallest was 10 pounds) at home with Kathi, and she also felt the baby’s positioning and adjusted me to aid in preparing my body for birth. I practiced pre-natal yoga and the exercises recommended by Kathi, and I don’t think I sat on the couch the last month of my pregnancy. Dan encouraged me to take yoga classes, see the chiropractor, and he treated me to a maternity massage each trimester. My midwife constantly fed me information, and listened to all my fears, concerns and scheduled time into our appointments to do so. At no point did I feel as though a natural birth at home wasn’t possible, and I approached childbirth as the most difficult physical feat I was ever going to engage in. At my 12 week appointment, Kathi, normally ambivalent about the necessity of ultrasound, recommended one for the purpose of placenta placement. At that point there was an indication it could be placenta previa, a rare condition where the placenta covers the cervix, and an absolute need for cesarean. You can’t birth the placenta before the baby without putting both woman and baby at grave risk. We scheduled blood work to be done the same day. The ultrasound revealed the placenta was indeed attached to the anterior wall, which wasn’t ideal, but it was not covering the cervix so a natural birth would be possible. Since everything else checked out with the lab work and the ultrasound, there was no need to visit radiology or the hospital again. The full moon rose and the sun moved into Aquarius on January 19, 2011. I was 38 weeks, and it was a Wednesday. I woke up that morning to the feeling of a head between my legs. Walking more resembled waddling, and I had a hard time standing still. I took a sub job that day, and as I walked out of school I announced the next time I’d see them again, I would not be pregnant. Thursday I dusted my baseboards and ceiling fans. My mom was due to fly in on Monday from Colorado, and I just had to get through the weekend and the baby could come. Kathi, Katy and Allie had been to our house the week before for our home visit to make sure we were prepared for a birth at home. We had our birth kit, our bag of linens, towels, receiving blankets, hats. The battery on the camera was charged. I planned to hit the grocery store the next day to stock up on our dwindling supply of groceries. I was ready for the race called birth, even if I wasn’t so sure about motherhood. I made some calls after watching Jeopardy to ensure everyone I was indeed still pregnant. Dan was watching a Netflix as I dosed off for the night around 10pm. He was just going to bed for the night when I sat up quickly, ‘My water just broke.’ I went to the bathroom, and sure enough, broken waters. I checked the time, it was ten minutes to one. I had to call Kathi. Ruptured membranes warranted a call to the midwife, even in the middle of the night. ‘No contractions yet,’ I told her. ‘I’ll call you when things get serious.’ I hung up the phone and said to Dan ‘You get some rest. I’ll wake you when I need your help.’ I figured I’d be laboring for several hours before I would need Dan’s support. In the meantime I ate leftovers and turned on Conan. Contractions started, and by the time Conan was over, I was too restless to sit. I paced and tried going back to bed but the contractions were keeping me from being able to lay still. They were getting pretty close together. I checked the time again and it was only 2am. Things were progressing much faster than I expected, so I woke Dan up. We timed a few contractions and they were three minutes apart. ‘That can’t be right. Time the next one.’ Same thing. It had only been an hour since my waters broke, this was supposed to take ten. We timed them again. I got in the shower to see if they would slow down, and they only became more intense. We timed contractions for an hour, and they remained ninety seconds long and three minutes apart. It was 3am and outside was puking fat flakes, and our unplowed road was drifting. After I hung up the phone, I asked Dan to make me a grilled ham and cheese. We grabbed the camera and took the last pregnancy pictures. I could only finish half the sandwich before labor became work and my appetite vanished. It was ninety minutes until Kathi and the other ladies arrived. In that hour and half I moved from the toilet to the bedroom floor to the bed, breathing through each contraction as they became more intense. When Kathi stomped her boots off at the front door, I was lying in the hallway at the top of the stairs moaning through a contraction. I was aware that my primal brain had taken over, and my body was devoted solely to birthing. Okay, so this was normal. I was supposed to be having one contraction after the next. I lay on the bed, as the moon glowed through our big bay window and sky lights. I moaned as Dan stroked my hair and Katy, one of the other midwives, sat nearby. It was one continuous contraction now, ebbing and flowing but never tapering off. I closed my eyes and commanded my cervix to open with the contractions that flowed one after the next. ‘This hurts.’ Open. Open. Open. ‘Maria, when you feel the urge to push, let me know,’ Katy instructed. Push? I couldn’t believe it. Then with the next contraction, there it was. Relief. I was in transition, and with the next contraction, I rolled over on the bed to my hands and knees. If I knew one thing, it was that I did not want to give birth on my back. Facing Dan, I pushed. Each contraction crashed and I bore down and pushed from my core. I waited for them to say the magical words, ‘I see the head.’ But none came. I pushed more. Frustrated, tired, sweaty, ‘Are we getting anywhere?’ I thought pushing was the easy part. Oh yea. I pushed with the next few contractions. I pictured my baby as he moved through my pelvis. With each contraction, I visualised him moving around my pubic bone. There! I felt him move. I felt his head slide down. We were working together, me and my baby. Dan fed me water through a straw that tasted like metal. Someone must have filled it at the tap instead of the filter. He wiped my forehead with a wet cloth. Each push I bit down on my lower lip, pushing the baby down. It was slimy, and it distracted me to touch it. I focused my mind and body back to birthing. Next Contraction: push; push; push. Drink water. Catch breath. Repeat. They coached me as each contraction came. Push, then blow it off. Push, then blow it off. I felt his head as it came slowly out, and looked at Dan with each contraction. Time stood still. The moon glowed down over Dan’s face and we stared at each other. The snow continued to fall outside, and we waited. The final contraction came, and the urge to push followed, and with a plop the baby dropped onto the bed. Purple-gloved hands quickly dried and capped his wet head. I turned. It is a boy. It’s my baby boy. ‘Did you catch the time?’ Kathi asks. ‘Yes, 7:54.’ A blanket wraps itself around him as he is pressed against my chest. Shaking, I fall against the wall, holding mybaby. Dan is next to me, kissing my sweaty forehead. I press my baby against me and breathe. Kathi demonstrates with ease how to breast feed, and as he is suckling, just moments after birth, they listen to his heart and lungs. Ten minutes later, I curl up in a contraction and expel the placenta. The following hours were filled with normal birth technicalities. The midwives made us breakfast, and Kathi monitored me closely in the shower and getting to and from the toilet. His apgar score at one minute was an 8 and at five minutes, a perfect 10. We took bets on what the baby weighed, and at a healthy 8 pounds 10 ounces, my guess was closest. I did not have an episiotomy, and only tore minimally, and certainly not enough to warrant stitches. Kathi gave us instructions and literature on how to keep the baby warm, monitor his temperature, pulse, and heart rate. We were given explicit instructions to call at any sign of change. I also was under strict bed rest, and we were given information on how to monitor my temperature, blood flow, etc. They remained with us until it was clear that both Timbre and I were healthy and it was clear we’d be safe left alone. They came for follow-up visits the next day and the fourth day. I did it this way for me. To prove that I could do it, to prove it was possible to engage in a healthy pregnancy, preparing vigorously for a difficult task, and accomplishing what I set out to do. I would love my son the same no matter what sort of birth experience I had. But I wanted the authentic birth experience, the real deal, and I wanted to experience birth in the intimate way intrinsic to its design. This was the birth of my child. I will never give birth to this child again, and I wanted it my way without interruptions, and without having to protect my birth from a system built on interruptions. I gave birth at home trusting that my body wouldn’t fail me, and it worked. My body worked exactly the way it was supposed to, and it didn’t need any medical assistance. The incredible capabilities of the female body still blows my mind. If men could have such understanding. It was difficult, but it was not impossible. It was painful, but not unmanageable. Everything in birth had its purpose, and my body knew that. I believed it, my midwives believed it, and nothing interrupted that process. When I doubted myself, the people around me did not. Timbre was Kathi’s 500th birth. 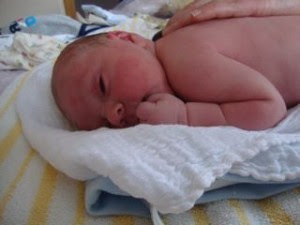 He was born in a blizzard at 7:54 am on the morning of Friday January 21, 2011 under the light of a full moon. Alex James Coleman, born March 16th, 2010. He was 10lbs 14ozs. Contractions started around 12:58 am on Tuesday March 16th. The contractions were 7 minutes apart for about an hour and then they went to 5 minutes apart till about 3am. Then the hard stuff, 3 minutes apart. I past the time by watching tv and bouncing on my exercise ball and walking around the kitchen. I was so thirsty, I think I drank a gallon of water that morning. Then I was asking myself when is the right time to call the midwife. So after the great debate in my head I decided to called her around 4 am. I told her not to rush because Rory took 30 hrs for labor. So I thought we had a long time for this baby to come out. But the midwife knew better, she had me go wake Chad up and get the pool ready. I was hesitant to wake Chad up, I just didn’t want to rush anyone or have him miss out on some more rest. I was totally in the mind set that this baby was coming but not for hours or days! I took Kathi’s advice and went and got Chad up, but I wasn’t in a hurry. I waited at least 30 minutes to tell him to set up the pool. But he jumped up with enthusiasm and was ready for our new little one to come. Kathi showed up around 5 am. She was ready to go, she brought in all her bags and started to set up for the “show.” I was checked at 5:30 am and I was at a 6 cm dilated! I was shocked, I keep saying this is too easy so far. I was so proud that this was happening so fast. Time to call in my support team! We called Miriam and Kim to get over asap! The gals put on a rush to get to our house with cameras in hand. They did an awesome job capturing this birth. I jumped into the nice warm pool to help relieve the back pressure, not sure if it really helped. I just felt confined in the pool, my knees kept falling asleep and I wasn’t comfortable so Chad helped me out. From the time I woke up Chad was right there helping me, he would press on my back to help with the back labor. He didn’t leave my side the whole time and in every picture he was smiling. I couldn’t ask for a better partner and coach! Kathi watched me as the contractions come and go. She saw the last contraction I had before birth and was like I think its time for you to sit down on the potty and have a contraction. I was hesitant to listen, but I was done so I just went with what she said. I sat down and she just knew. My water broke and I was ready to push. I was asked where I wanted to labor but I was out of it. She reacted quick and grabbed my exercise ball and I hunched over and pushed this baby out. It took 15 minutes to push our little one out. I asked Chad to look and see what we had and I was shocked to hear we had a little boy! Words couldn’t describe our joy at that moment. He was born at 9:01 am, March 16th. Chad got to cut the cord and hold our little one. We are all doing great and happy to have a successful home birth. Thirteen years ago I planned a homebirth. It was in Colorado. I was young. The baby’s father was supportive, and loving. Our families, however, were terrified. No matter, we were 2,000 miles from them. We found a midwife. A green midwife – I was to be her first solo homebirth. She was a former engineer. I’ve worked with engineers for the bulk of my career as a technical writer. After all, we lived where Hewlett-Packard headquartered in Colorado. This was no surprise: an engineer that wanted to be a midwife I thought that very cool. With systematic, schematic schedules, we attended prenatal visits. Everything was sterile, exactly placed, and accessible in her home office. I could tell she was an engineer. She presented charts and graphs of our progress. She offered document, upon document of information about homebirth and genetics, and baby-delivering. By the end, I just wanted to feel the homebirth, not think it. The pregnancy was ultra smooth – I loved having a baby grow in me. Nothing was troubling. I was healthy, the baby was healthy. We both felt good – the entire time. Not even a bout of heartburn! I couldn’t wait to meet this spirit growing inside me. It was a really hot day – the hottest in recent recorded Colorado history. July 1, 1998. Suddenly I felt sick – like my stomach was upset; I thought I was coming down with diarrhea; I was sooo tired. Then the contractions began. So small at first. The baby was coming soon! We scurried around, washing bedding for the birth, organizing the room for the midwives, paying bills. On the way to the mailbox, I realized we hadn’t actually put stamps on the stack of bills we were mailing – utilities, mortgage, phone, credit cards. In the midst of a stronger contraction, I tried to get the baby’s father’s attention, as we pulled up to the blue mailbox in town. Too late. He dropped the envelopes into the box, all without postage. As I breathed through the waning pains, I let him know. Unfortunately, there was nothing we could do….they would likely end up in the dead letter office, checks and all. This was probably the beginning of what would be one of the most anxiety-producing experiences for him in his life. He took care of things by calling each recipient and borrowing money to cover all of the expenses to avoid late charges. Meanwhile, I sat in the bright Colorado sunshine, on our beautiful deck, and breathed through contraction after contraction, each getting stronger and more exciting, albeit more painful. Our midwife, the engineer, told us to call her when they were exactly five minutes apart. Exactly? Five minutes from the beginning of one to the beginning of another? Five minutes from the end of one to the beginning of another? I just wanted to do this right. Sometime during the night, the contractions increased. I couldn’t sleep and I couldn’t keep track of five minutes apart. I woke up the baby’s father and told him he should call the midwife. She rushed over, sleepy-eyed, and in a haste checked my cervix. “You’re dilated to four centimeters,” she said. “Four, I thought,” I’ve been laboring for most of a day and into the night and I’m at four centimeters? I was discouraged. I knew I had a ways to go. And I was tired. She suggested sleep and said she’d return in the morning. That was a long several hours. I couldn’t sleep. The contractions kept me awake and no position was comfortable for sleep. But still, the baby’s heart rate was strong. Push on. When the sun came up, I can’t say that much was different, except that I was really grumpy. I didn’t feel like eating. I didn’t feel like sleeping. 24 hours later and I wasn’t sure what to do next. We called the midwife. She said she would come over and check me soon. Hours passed. I did laundry. I walked the dog. I paced. Contractions five minutes apart and no water yet. Sometime in the afternoon she arrived. But I can’t tell this story without telling about Joy. She was my childbirth educator and became a fast friend during my pregnancy. She arrived long before the midwife and took me on several long walks up and down the foothills of our neighborhood. She made me laugh. She made me confident. She made me tea. She lost a long and courageous battle with cancer at 32 and is now in a pain-free place I’m sure. But those couple of days, she knew birth. She had her own two babies at home and she knew all would be well. She gave me that gift during those difficult days of labor. Day Three: Dilated to five centimeters. My midwife was perplexed. My water hadn’t broken. She called her mentor. Yenni (spelled Jenny) arrived from Boulder. Long hair, long skirt, spelling of patchouli. She was in her fifties but didn’t look it . She had a very soft voice, and more than 2000 births behind her. She stroked my forehead, asked the baby’s father to leave my side, and talked to me about courage. Then she pulled out a knitting needle and broke my water. It was midday. After that gush, she reached deep into my cervix, she examined my enormous baby belly and declared that the baby was posterior. He couldn’t navigate the birth canal effectively. So with Joy by my side in the backseat, she drove me to an acupuncturist for pain relief. The pain, by the way, had not subsided in three days and was nearly overwhelming during contractions. This baby was trying so hard to be born. Next we went to a chiropractor. After about an hour of adjustment through several contractions, she and Yenni successfully turned the baby out of posterior position. Surely, this is what I needed. And never would have guessed it like this. Back to the house, through winding Colorado roads, to my bed, where afternoon was waning, the heat strong, I felt surprisingly less pain (needles still in my toes from the acupuncturist), I closed my eyes and Yenni prayed with me. Good news: dilation to seven when Yenni checked me at five pm. She guided me softly on transition – the ring of fire. She told me I had to summon all of my strength for this, after these long days with little sleep, to push this baby out. And then she said in no uncertain terms, “If the baby doesn’t come by nightfall, we go to the hospital.” My midwife shuddered at that thought. I felt it from across the room. Everyone was quiet. Midwives in Colorado were not allowed to carry Pitocin those days. That’s the drug that speeds delivery, and in my situation, would’ve helped immensely. Many hours had passed since my water broke and the risk for infection was growing, as was my dehydration. Still laboring, the sun set. With a palpable sadness, we loaded into the cars, and drove the thirty miles to the hospital. Yenni took control. She sequestered my midwife, and the baby’s father, and instructed each of us on what to expect and what we’d do. We wouldn’t be met kindly by the hospital staff. She was right. They ushered a wheelchair to me upon arrival, forced an IV into my arm within minutes and scolded the midwives on my condition and the baby’s slowing heart rate. Yenni was a pro. She explained what the last two days had held for me, and even helped them to figure out if the baby was still in a non-posterior position. He was. She argued against the emergency c-section the doctor ordered, and for the almond oil for perineal massage at the right time (sterile to me); she told them I wanted the miso soup we packed, instead of hospital food, and the placenta would go into the cooler, to go home with me. They obliged on all fronts. But there was no way I was going to be able to push out this baby in my weakened state without Pitocin – agreed, by all. Once comfortable in a white hospital bed, with a blue gown on, with two IVs in my arm, I slept, deeply. For the first time in three days, I experienced sweet sleep. Not more than two hours later, a nurse came in to check on me. I remember her shaking my shoulders, “Wake up, we’re going to have a baby!” she said with the biggest smile on her face. Somehow in my exhausted state, I slept right through contractions of transition and was fully dilated. She said she could see his hair. In moments, the dark hospital room became a flurry of activity and bright lights. Without changing position much, I spread my legs, and in five pushes, Joseph Gabriel Bourdages game into the world. It was 1:09 a.m. July 3,1998. Sixty two hours after that first contraction – a record for both midwives. He was no longer sunny side up, as they say, but instead of his head coming first, his right hand, over his head, greeted the world before the rest of him. This explained his trouble and mine with dilation. He was a little stuck. That was my first homebirth. Fast forward three years: Traverse City, Michigan. Joe is now two and a half. It is a rainy spring day in early April. My swollen belly and spirits are ripe for birth. I push Joe on an old metal swing set in a tiny park near East Bay. The wind picks up, as do the contractions, and I hold onto a tree to steady myself. It’s about four in the afternoon. I don’t speak a word to anyone – not friends, not family, not even the baby’s father yet, but know deep inside that my baby will be born tonight. Rain increases and we call Kathi – the very non-engineer-like midwife who is assisting me birth this baby. Totally different feel from three years ago. No anxiety. No concern. Just steady contractions that feel like work. She says, “Call me when you feel like you want to sit on the toilet.” That made me laugh. Within a few hours, I wanted to sit on the toilet. I did and we called. She said calmly, “I’ll take a shower and be over soon,” No rushing. No anxiety. Kathi arrived with her assistant Kate, and a midwife of old, and her oldest daughter, Tara. Tara was to look after Joe during the birth, and bring him to my side when I was pushing. This was to be Tara’s first experience with birth and her mom’s amazing work as a midwife. I welcomed that gift and felt honored to be a part of it. And just as Kathi said, a few hours later, at 11:00 p.m. I welcomed a second son into the world. This time in my bedroom, submerged in an inflatable water tub, with his big brother as the first one to hold his tiny hand. He even helped cut the umbilical cord, which I swear forged a bond between these brothers that I’ve rarely seen. Joe and Elliot, in the world together, with all of its trials and triumphs, always together, with Joe reaching out his hand to his brother. Many times I’ve looked back on these two experiences and wondered how each has shaped the personalities and sensibilities of my boys, and myself as a mother. Joe is nervous and inclined to medical procedure (he wants to be a doctor), and always the last one out of the house when we’re leaving. Elliot is free-spirited, craves to be in water, and is the first to act without thinking. Both have taught me how to approach each of them with their unique life experiences. And about birth, my opinions haven’t swayed. Birth is not a medical condition, unless there’s complications. Births in hospitals are not necessary for uncomplicated pregnancies. Homebirth is safe in nearly all situations. Midwives know birth and women’s bodies sufficiently to guide a woman through delivery, but really, she knows instinctively what to do – no need to tell her. It’s been happening for thousands of years, the same way. I come from a long line of Italian women who gave birth in their homes, with a “midwife” who was really an older aunt who had been to many births, could encourage, and knew how to handle a newborn. She wasn’t certified in anything. This was my Joy – my “midwife” during Joe’s birth. And this is is the spirit that Kathi brings to birth, in addition to all of her training and medical experience. Time and time again, throughout my life, it has been proven: when we can get our heads out of the way of our goals and dreams – from birth to career – we know what we have to do, and we can do it well.